CASE India inaugurated its largest dealership at Indore, Madhya Pradesh. 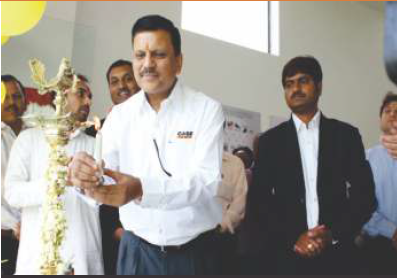 The dealership, spread over 35,000 sq ft, is a fully integrated 3S (sales, spares, service) facility with a showroom area of 7,200 sq ft.
CASE Construction Equipment, a brand of CNH Industrial, inaugurated the new M/s Balaji Tractor House integrated 3S (sales, spares, service) dealership at Dhar Road, Indore on April 15, 2015. With the new facility the brand aims to expand its sales and service operations and enhance the facilities available to customers in and around Indore. The inauguration ceremony was attended by Mr. Santosh Patidar, Managing Director of Balaji Tractor House, Mr. Abhijit Gupta, Managing Director of CASE India and Management representatives from CASE and CNH Industrial. Balaji Tractor House, which successfully runs branches in Khargone, Khandwa, Ratlam, Mandsaur, Ujjain, Dhamnod and Sonkutchh will bring to customers in Indore the benefits of its experienced and professional staff. The 35,000sq ft dealership is equipped to the high international standards of CASE dealerships with a fully integrated 3S set-up to provide customers with a one stop solution for Sales, Service and CASE Genuine Parts. The sales team operates from the facility's 7,200 sq ft showroom. The 5,000 sq ft workshop is equipped with all the latest tools and has four service bays with pneumatic cranes, welding bays, washing bays and a dedicated engine service bay to carry major repairs swiftly, minimising the down-time of customers' machines. The new Balaji Tractor House 3S facility is conveniently located at the Dhar Road in Indore, increasing the ease of access for the customers to the latest product range of CASE India along with a superior after sales support.